we think alike 🙂 without my notebook, I think I’ll fly into a frenzy 😛 Happy weekend!! Although my family and personal possessions are important to me, I choose to bring an important message to Photo Hunters today. jmb, I just helped a friend order a new desktop computer and we ordered 2 gigs of RAM. I can understand your need – I have only 1 gig. Nice wallpaper on your laptop – your 2 favorite girls. And of course books are really important. Great shots! 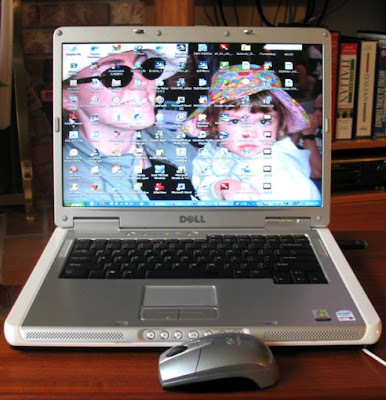 I love my Dell… I’ll never have another desktop, that’s for sure! WoW! Great way to combine all kinds of important stuff! I, too, would be LOST without my books! What a clever idea to combine the photograph of your daughter and granddaughter with your computer. Great screensaver shot. Books are very important to me but I didn’t even think of that one. Good take on the theme. Hope you have a great weekend. We have a Dell Inspiron 1720, which is lovely and which we all enjoy. Just have to queue up sometimes. Have a great weekend JMB. Books… Fidel and I are the same… book hounds to the nth degree, and can’t see a life without them. What few bookshelves we have are waaaay overflowing. Fidel is now into the electronic types which are rapidly filling up our cyber space as well. Time to find dedicated electronic “bookshelves”. I was thinking of posting a photo of my new laptop, but then, again, I thought of deviating a little from the norm hehe. I do love books too! And yeah, they’re also piling up on the floor of my bedroom. I need to buy a bigger bookshelf. I thought the same ! Our families are of course important and I also put my laptop in the first place ! A window to the world is very important in our age ! Great pictures, as always, JMB! How funny – I thought about my computer too and also our bookshelves full of books and my family too. Got a couple of pictures of a couple of other important things. Nice choices for The Hunt. Neat interpretation of this week’s theme. My laptop and my books are very important to me, too. Thanks for the visit. Have a lovely weekend! 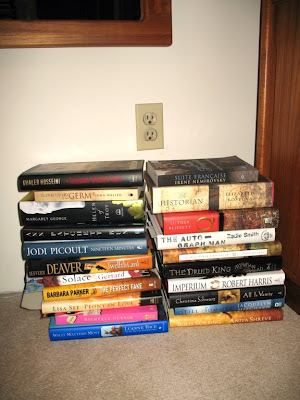 I relate to all your choices, and it seems we share a taste in reading matter:) I have read most of those authors, if not the actual titles, including the House of Niccolo series. I too love books….if you skip around my blog some, a couple of Fridays ago, I posted some of our books…..love ’em. Computers and books are certainly important. Our humans are voraciously readers and have many, many books. Great for the theme. We can be in the hunt because we have a computer. I have lots of books too and I wish I have more than 24 hours each day. I love looking at people’s bookshelves. I see you have Suite Francaise: I bought that for Daughter-in-law for Christmas. is it good? It is very grey and wet here today. Hope your weather is better. I very much appreciate your important things, too. I have piles of books that need reshelving this very moment. Thanks for stopping by Pollywog Creek on the hunt this weekend. I hope you are having a weekend filled with all that is important. I agree. Computers and books are both very important… computers especially these days. Yup, these tech gadgets are becoming very important in our lives. The books! You said autographed? Wow! Have a great weekend,JMB. Love your granddaughter’s photo on the desktop. Thanks to everyone for visiting my photo hunt today. Have a great weekend. In terms of possessions, I’m tempted to agreee. Though I’d include my CDs. I admit I would be lost without my computer. And my books! 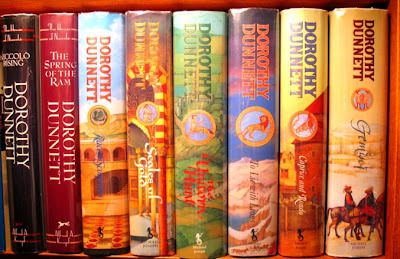 I don’t know Dorothy Dunnett at all – must look into this. I love photos of books, as you know.So nice to know there’s someone else who doesn’t get rid of them! How did you find “Imperium” which I notice in the pile? How cool that you have books signed by the author.